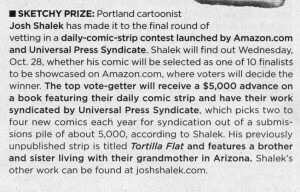 I always wanted to be published in the Willamette Week, a weekly free newspaper here in Portland, and now I am. It isn’t my comic; rather, a blurb about my comic. Will my comic make it to the next round? We’ll have to wait until next week to find out! *This post has nothing to do with Halloween, yet I find myself trying to make the connection regardless.